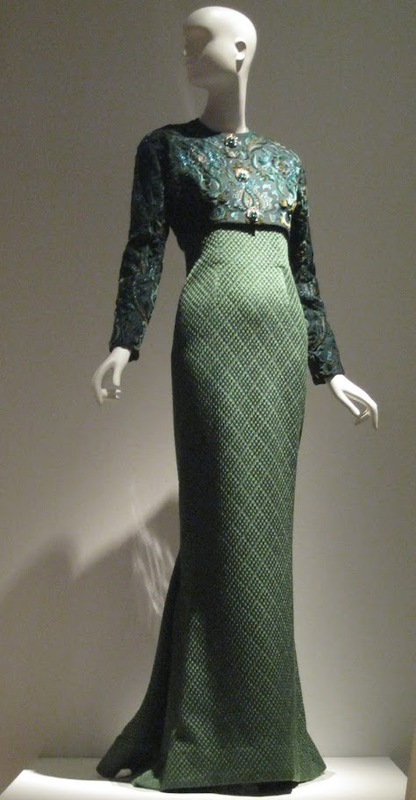 From IMPACT: 50 Years of the CFDA, now on view at The Museum at FIT, a green 1989 ensemble from Carolyne Roehm, perfect for St. Patrick’s Day! It was nice to see work by Ms. Roehm on display, especially since she doesn’t design dresses anymore. Her website has some photos of her clothes from the time her line was active, from 1985 until 1991 (and there are pictures of young Linda Evangelista, Naomi Campbell, Karen Mulder, and Elaine Irwin), but the bulk of the site is devoted to her home design. She was Oscar de la Renta’s design assistant for 10 years before she started her own label and I think you can see an aesthetic similar to Oscar’s in this green gown and jacket. It is the perfect representation of her elegant and ladylike work. If you have time, there is an interesting interview with her on David Patrick Columbia’s New York Social Diary and yowza, take a look at those interiors of her house! Carolyne, invite me over for some champagne and an interview for my blog! What a fabulous way to wear green! Happy St. Patrick's Day, Jill! What an interesting and different dress. The pattern in the skirt is not your typical evening gown!